Also, you will be able to participate in a training session for Holistic Makeup Application. If you would like to be Certified as a Holistic Makeup Artist sign up for the post conference workshop. During this workshop you will learn how to use natural, non-toxic substances as an alternative to conventional makeup ingredients. Please contact us at 269.384.2170 for more information. -Annual membership renewal, plus conference registration: $190. Speaker: Dr. Andrey Lutskovsky M.D. D.O. Dr. Lutskovsky will demonstrate therapeutic use of ozone for the face and entire body. First he will discuss ozone injections and topical applications combined with other treatments. Dr. Lutskovsky will then demonstrate systemic intravenous ozone treatment. During the conference Dr. Andrey can treat you with ozone for the special conference price of $350 (regularly $500). Appointments are limited. If interested, please call 269.384.2170 to reserve your spot (prepay only). Upper arms are one of the most challenging areas to firm. Even plastic surgery does not offer an effective solution without leaving long noticeable scars. Elina will present new formulations and techniques to help your clients achieve tighter upper arms. Speakers: Elina Fedotova, Keeley Lore, and Dr. Mark Gerald M.D. Keeley Lore, Dr. Mark Gerald M.D. and Elina Fedotova will discuss nutritional strategies to balance the digestive system. You also will learn how to improve the abdominal area through the use of herbal applications, acupressure, and other holistic methods. A growing health concern in the United States is the increase in autoimmune disorders, especially among women. This lecture will present an overview of the intricacies of the immune system and of the most common autoimmune conditions we encounter in the treatment room. 3:15 – 3:45pm: Pranayama and Meditation. Yoga Poses Helpful for Estheticians. Cindy Sabo and Kathy Poel each have a Holistic Skin Care Practice for over 15 years. They will discuss the role psychology plays in running a successful skin care business. Learn safe ways to incorporate microneedling in your esthetic practice to achieve the best results for scar reduction and aging complexion. 9:15- 10:00am: Morning Chat with Elina (Optional) Enjoy one on one time with Elina at the Chicago Fire Oven restaurant across the hall from our conference room. Determine the most beneficial regimen for your clients with the use of Kineosological testing. This will be a hands on learning workshop. Sensitive complexions can be some of the most challenging to work with because we are constantly worried about a reaction. 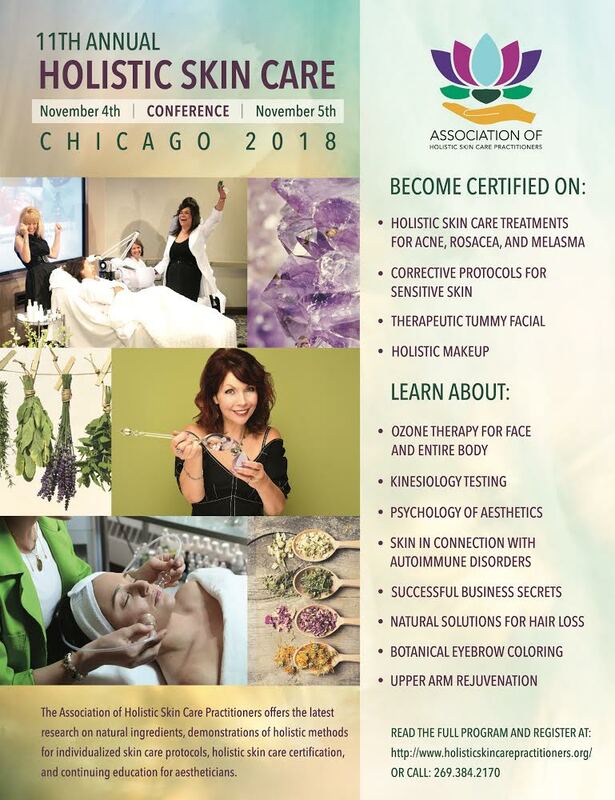 Elina will demonstrate the best solutions and techniques to help you to achieve corrective results for clients with extrememly sensitive skin. The role botanicals like birch tar oil, burdock root oil and fermented botanicals can play to restore hair growth will be discussed. This will be a hands on learning workshop that includes a demonstration of a Hair Restoring Scalp Treatment. Learn how to professionally apply 100% natural, edible makeup created by Elina which has already been used on national television. Practice your best professional look. Find out how to hide and enhance your best features. This will be a hands on learning makeup workshop. Learn the secrets of business success from top estheticians and spa owners. Highlight the latest research on natural ingredients. Provide information about noninvasive methods for corrective, antiaging and anti-inflammatory skin care treatments. Offer demonstrations of European and Eastern methods for individualized skin care protocols. Provide holistic skin care certification and continuing education for aestheticians. Offer networking opportunities with holistic practitioners. Support holistic health and skincare research. Show that a non-invasive approach to skincare is an effective long term solution for healthy, beautiful skin.